Hoping to go see Noah tomorrow night. I’m not expecting the film to be a blow-by-blow retelling and no one seriously should have expected it to be for a whole bunch of reasons. The Noah text of Genesis 6-9 consists of approximately 2000 words in the English Standard Version. You could read it in less than 15 minutes. There’s almost no speaking, except by God, and a bit from Noah at the end. To make anything other than a short film or a silent one, is going to require a large amount of creative licence. Every frame of (digital) celluloid and all the sounds you create amounts to some kind of ‘creative licence’. That’s what art is… no? Two key criticisms of the film that emerged on various blogs and posts I’ve read are that 1. it isn’t faithful to the Biblical narrative, and 2. it features a strong environmentalist theme, i.e. values are defined by attitude to the environment. This post is a rough sketch of my thoughts and other issues related to the above criticisms, prior to viewing the movie. Paramount is hoping “Noah” will connect with religious Americans who “may not necessarily go to more than one or two movies a year,” said Paramount Vice Chairman Rob Moore… “There’s creative interpretation that goes into things that aren’t directly addressed in the underlying material, and so you always run the risk that people take exception to those stories,” Mr. Moore said. Once that process is complete, the challenge shifts to getting both mainstream moviegoers and religious audiences into theater seats, a process that relies both on specialized marketing to those eager for a faith-based film as well as marketing that appeals to those searching for a “popcorn” movie. On the other hand, the movie (with or without the help of the disclamatory statement) might have actually encouraged people to investigate the story for themselves. For example, the Bible Society reports that online bible reading of Genesis 6-9 has increased since the release of Noah. Maybe not the result those critics were expecting or predicting. But whether the Paramount statement is accurate or not, the trueness of the story to the original text is clearly the source of contention for many. I will suggest some of those challenges later. On one level, the criticism really shouldn’t be all that surprising – Aronofsky is culturally Jewish and he’s influenced by the Midrash tradition. In the past – I’m estimating around 1998 – he’s described himself as Godless but for the god of narrative filmmaking – by which I take him to mean it gave him ultimate meaning and purpose. The moment that it “grieved Him in his heart to destroy creation,” is, for me, the high dramatic moment in the story. Because think about it: It’s the fourth story in the Bible. You go from creation to original sin to the first murder and then time jumps to when everything is messed up. [The first three stories in the book of Genesis, the first book of the Bible, are the creation, Adam and Eve, and the story of Cain and Abel, which is often referred to as “the first murder.”] The world is wicked. Wickedness is in all of our thoughts. Violence against man and against the planet. And so it was so bad that He decides that He is going to destroy everything and destroy this creation. So what we decided to do was to align Noah with that character arc and give Noah that understanding. It seems to me that Aronofsky is really fascinated by the story of Noah – it speaks to him in some meaningful way and is interested in these rather universal, timeless questions of the problem of evil, the role of humanity. That’s a good thing. As far as it goes. The “violence… against the planet” represents his particular way into the story, but more on that later. Based on the background information, then, I question whether the hullabaloo is necessary. People shouldn’t be surprised and act all outraged if Aronofsky’s interpretation is not the Christian one. He’s not a Christian and he didn’t set out to make a Christian movie. And that’s not shocking. The more surprising thing would be if Aronofsky had made a version of the story that was pleasing to 100% of believers, with the story explicitly placed within it’s complete theological context. But what exactly would a “biblically faithful” version look like anyway? It’s not as simple as getting the order of events right. Movies and stories typically involve a protagonist who wants to achieve something but an internal flaw and an adversary keep him back. In the course of overcoming the flaw and adversary, the character learns a lesson (or not) about how to live or not live life. That’s simplistic I acknowledge. There are a whole bunch of different story shapes, but many stories contain these elements. That’s Story 101. Rising tension: as Noah builds the ark, will anyone repent? as flood waters approach and rise, will anyone survive? Climax: God remembers Noah. Ultimately, only Noah and his family are saved, and God reaffirms the creation blessing/mandate, to be fruitful and multiply. A new creation and a new humanity, right? Resolution: Soon after the new creation, problems begin again, with Noah and his family indicating that humanity is yet in need of restoration and the promised saviour is yet to come. The Biblical account of Noah, then, is seen as a story within a story of salvation history, which connects the beginning of the creation, the fall, to the redemption won by Jesus, and an ultimate new creation. This is why Christians care about the treatment of the text. Ultimately, in some way, it points us forward to Jesus. As salvation history, the Bible’s primary focus is theological and Christological. How does one express those theological aspects on screen and transmit the message faithfully? It’s certainly not just a simple matter of putting the events up there in the right order with historically accurate details, or someone reciting reams of text. There’s the question of back story, aligning competing views, particularly problematic for a story like Noah in which only a handful of characters – God, Noah, Noah’s family, the rest of humanity – are mentioned. A prima facie reading of Aronofsky’s interview suggests to me he gets a lot of the background work right – even if tracing the story through and beyond the Old Testament we would eventually land at different places as to what is the solution to the sin problem – Jesus. People might question the whole basis or reason for doing such a film in the first place, but I’m interested to see how much of this background work is developed in the final film. This can be engaged with fruitfully. Now to the big non-controversial thing. Thematically, Aronofsky chose the theme of the environment. And again, it shouldn’t be that surprising. It’s a relevant topical theme of the last 40 or so years and will continue to be for the next century. If we’re still around, and not drowned or hit by an asteroid or stuck in some kind of Matrix. But then how would we know? Even if environmentalism as a theme dominates the movie Noah, it need not be totally repudiated. And it can still be a decent movie either way, or not. 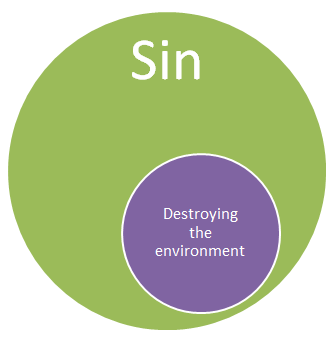 Now, some worldviews place the environment equal to humanity or above it in the place of God. And when they do, things get out of order. Not only is this view of the world skewed, either the environment or people end up suffering. Humans are more valuable than the environment, but abuse of creation is an affront to the One who made it too and it is detrimental for humans when we mess it up. So this leaves me with the questions I will bring to my review: To what extent does Noah succeed as a film – is it entertaining, emotionally engaging, characters, acting, or exhibit artistic or technical merit? What is Noah’s goal, flaws, the antagonist, how does he change in character between the beginning and the end? Is the depiction of humanity true? Does it say anything worth saying? Does Aronofsky’s ground work for the film come across on screen? Not too different from questions I’m asking here ordinarily. How uncontroversial.